Augmented reality technology is in its nascent stage in present time despite this fact; there are many reasons to consider that growth will climb sharply in the years to come. There are many explanations for this, including the statistic that augmented reality is becoming more common in a multiple industries, such as automotive, healthcare and entertainment, as well as in the everyday workplace. The automotive industry has just begun to see the use of augmented reality in their vehicles for enhancing driving experience to its manufacturing and sales of vehicles. The use of augmented reality technology in new vehicles is now a trendy technology which is provided in some luxury vehicles only, but over time, as this technology becomes standard in vehicles, consumers will begin to descend towards this technology, and this will be the major growth factor for the automotive augmented reality market. Goldstein Research analyst forecast the global augmented reality in automotive market to expand at a CAGR of +32% during the forecast period 2016-2024. Further, the overall augmented reality market is anticipated to surpass USD 90.0 billion over the forecast period and the automotive industry is projected to share about 12% of the total augmented reality market during the forecast period. The report covers the present ground scenario and the future growth prospects of the augmented reality in automotive market for 2016-2024 along with the total revenue of augmented reality in automotive industry in every region. We calculated the market size and revenue share on the basis of revenue generated per segment, regional and country level. The revenue forecast is given on the basis of number of augmented reality and automotive manufacturers and current growth rate of the market. Augmented Reality Automotive Market Report has been prepared based on an in-depth market analysis from industry experts. 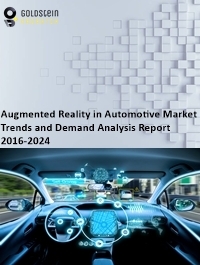 The report covers the competitive landscape and current position of major players in the global augmented reality in automotive market. The report also includes porter’s five force model, SWOT analysis, company profiling, business strategies of market players and their business models. Global augmented reality in automotive market report also recognizes value chain analysis to understand the cost differentiation to provide competitive advantage to the existing and new entry players. Our global augmented reality in automotive market report comprises of the following companies as the key players in the global augmented reality in automotive market: Volkswagen Group, Daimler Group, Continental AG, WayRay SA, Visteon Corporation, and Panasonic Corporation. Based on product type, Standard AR HUD units are expected to dominate the augmented reality in automotive market across the globe. Research and development activities by the major automotive manufacturers such as Volkswagen, Daimler and BMW to provide enhanced AR products and services in their cars, will significantly boost the AR in automotive industry market growth in coming years. Geographically, North America region dominated the global augmented reality in automotive market, accounted for more than 40% revenue share in global automotive augmented reality market. Asia Pacific region is anticipated to be the fastest growing automotive augmented HUD market, which is likely to expand at a CAGR of 35.6% over the forecast period. According to our global augmented reality in automotive market study on the basis of extensive primary and secondary research, one major trend in the market is development of foundational technology and significant R&D announcements and collaboration projects. Many automotive OEMs and tech companies are in race to develop self-driving cars incorporated with augment reality technology to enhance driving experience and to expand the safety features. The use of augmented reality is essential to the growth of driverless vehicles, as information on the path and key performance data could be displayed on augmented reality screens. According to the report, major driver in global augmented reality in automotive market is growing investments by automotive companies to introduce this trendy technology for their vehicles and marketing of their brands. For instance, German auto-maker Volkswagen recently introduced an app for its luxury brand Audi AG that allows customers to experience the AR-based test drive, without actually being present in the automobile. Further, the report states that one challenge in global augmented reality in automotive market is reducing cost and economizing of technology for mass consumers. Automotive augmented HUD displays are majorly provided by the some major automotive OEMs in their high-end variant of vehicles, as these HUD systems are still costly and can be afforded by the luxury car customers. For a full detailed overview, send us the sample request for the market report sample.